An excellent paper by M. E. Levine, et al, entitled "An epigenetic biomarker of aging for lifespan and healthspan" describes a technique for combining nine blood-work values with calendar age to calculate your Mortality Score (probability of death in the next ten years) and your Phenotypic Age, i.e., your apparent biological age as implied by your blood variables. The calculation procedure is rather arcane, involving non-obvious unit conversions, exponentials, and logarithms, so I have produced an Excel spreadsheet (LINK) for performing these calculations. Levine, et al., also used an elaborate DNA analysis of many blood samples to find what they call the DNAm PhenoAge, a measure of the degree of DNA methylation present, a phenomenon associated with aging. They correlate this measure with the Phenotypic Age, showing that they track very well. My spreadsheet uses a fit to their plots to estimate your DNAm PhenoAge and the modified Mortality Score that it implies. 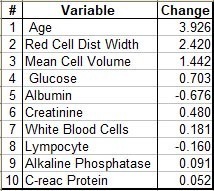 You may already have blood-work giving the nine blood variables needed to use this spreadsheet, but if not they can be obtained by purchasing the blood-work of LifeExtension's Chemistry Panel & Complete Blood Count (CBC) ($35) and their C-Reactive Protein (CRP), Cardiac ($42). On the spreadsheet at the upper line of blue numbers, you simply enter your values in place of the ones presently there and enter your decimal calendar age in the last column. The calculated results then appear in red on the last line. It is good to have started a fresh new thread on the Levine's paper and providing your calculator. Thank you again. However, I feel worth also to refer everyone to the thread started by Dan Mc on the same topic/paper where there is an important follow on discussion in particular about integration of several categories of possible biomarkers of aging (e.g. molecular, clinical, anthropometric, machine learning driven, ...), the role of inflammation as characterized by biomarkers as CRP and IL-6 and the intriguing role "geometric" factors as MCV/RDW have. A nice follow up here could be to gather information on trends along the years rather that only measurement at one point in time as better tacking the interventions we are trying. I have written to Dr Levine along these line (no reply yet) and wonder if you got a reply on the CRP vs. MCV/RDW role. Dr. Steve Horvath answered, saying that they did not have any explanation of the relative weight strengths because it was a numerical optimization that didn't involve human judgement. My own theory is that the two blood geometry factors are so important in determining the Phenotypic Ager because senescent blood cells have a different geometry from normal blood cells and their increased presence trends to increase both MCV and RDW. I believe It is a reasonable hypothesis and it wold be worth some research for which I lack time. AFAIK it is quite well established both MCV and RDW increase with age and are associated to mortality and morbidity as cardio vascular diseases (see also the other thread). As much of this is mediated by “inflammaging” it would be interesting to test whether the Senescence-Associated Secretory Phenotype of the cells (SASP) which characterizes senescence in particular in response to inflammatory signalling, likely in all tissues, incl. blood, is also associated to morphological changes which would mechanistically explain the high weights in the Levine’s regression in step 1. Note also that in the regression weights it is rather the variance of MCV (i.e. RDW) which is impactful rather than the MCV itself which makes me wonder, once again, about the higher heterogeneity of the aging population sample as I was mentioning in the previous thread. Worth to follow! To modify my hypothesis slightly, the blood geometry factors may not reflect senescent blood cells per se, since the body replaces blood cells fairly regularly. Rather, enlarged out-of-geometry blood cells reflect the presence of toxins and bad chemical signals generated by senescent body cells with which the blood cells come into close contact. I tried to refine our estimate of the influence of the factors used in computing the Levine PhenoAge by making a 5% increase in each single variable and observing the change (in years) it made in the PhenoAge. The results, ranking the influences in order, are shown in the tablebelow. What doesn't show up here is the size of the expected variation of the variable. For example, the C-reactive protein value can change by orders of magnitude in the presence of a wound or infection. Patel KV, Semba RD, Ferrucci L, et al. Red cell distribution width and mortality in older adults: a meta-analysis. J Gerontol A Biol Sci Med Sci. 2010;65(3):258-65. That's interesting. I note that the "blood age" version 3.0 calculation on the Aging AI website doesn't even include RDW as one of its input variables. Yes, thank you. I did not realize that. MCV is included though. ML/AI are black boxes though which lack the explanatory power of system biology approaches but can generate hypotheses to test. On the other side Horvath’s reply to your note seems also to indicate we do not have a biological understanding underlying the step 1 algorithm neither. I also understand the role of DNA methylation in step 2 is also not completely clear (they try to understand in step 3) in particular its associative or causative role in aging. Along the lines of the answer you got from Dr. Horvath (thank you), Dr. Levine answered my note on the relative roles played by the clinical biomarkers used for the phenotypic age calculation. While recognizing the RDW's big impact on the estimate, she warns the weights listed in the table were not standardized to allow for a direct comparison. JGC Thanks for the Aging AI page. I'm 52, the spreadsheet puts me at 40 and Aging.ai 3.0 puts me at 28, FWIW. Interesting. Have you tried also the V 1.0, just curious? It includes 41 parameters (vs. 19 of V 3.0) and I think it should be more accurate. In my case V 3.0 has been giving systematically way too low values. This is something I would expect to be considered on future follow on works. Would you agree? albedo I'll try the earlier version, but assuming they used machine learning (a deep NN) for this, while larger (more input parameters) is generally better even more it's the population data. For example, if I was doing this (I'm a machine learning engineer) I would just take the blood results and age from a large population and make a conv net from that. Easy, but the population has a hidden skew which is it is made up of people who eat the SAD (Standard American Diet) and probably few if nobody like us who practice extreme health habits. So we're probably outliers, my numbers (cholesterol, WBC, etc) are so low they flag in the reports. So your typical 28 year old they measured is still eating SAD, so perhaps we don't fit in the sample set. Zhavoronkov A, Mamoshina P, Vanhaelen Q, Scheibye-knudsen M, Moskalev A, Aliper A. Artificial intelligence for aging and longevity research: Recent advances and perspectives. Ageing Res Rev. 2018;49:49-66. Hi Dan, in case you will find some time to look at the two papers Insilico Medicine gives to reference resp. the v 1.0 and v 3.0 of their aging.ai predictor, maybe you can have a clue on why the two versions differ so largely. In my case v 3.0 is systematically lower than v 1.0, in average -33%. I only did a superficial reading of the two different references so maybe I am missing a crucial point likely in the ML process they use. Thank you ! albedo papers summarize and show results so unless they call out your question specifically you usually have to contact the authors directly. In this case the approach they took is standard and they have a large population (120kish) from three countries, should be pretty good. Unless you/we are 1/1M (1 in a million) instead of 1/111k or better the network should be a good estimator. Anyhow I’m definitely an outlier so the network is probably a poor predictor, and the discrepancy isn’t clear. Other than when networks mispredict they often do so badly. 28 for me seems too low. Or is it? My blood work is awfully good. They claim good generalization so are confident. You might send an email, they might answer. JGC thanks for the spreadsheet. FWIW I have Ptypic Age of 40.35 and est DNAm Age of 39.97 (I'm 53) - so by this measure I'm biologically 40, which is approximately what I would guess to be my biological age, so pretty good on that count. Here's an useful small hack - put your numbers in and vary them to see how you can make your bio age go backwards and by what degree. For instance driving your glucose down by 10 points gives you an extra year (at least for my numbers). Higher albumin is better (liver function I believe), as is lower creatinine (indicating healthy kidneys). This can be useful as a tool for what to work on with your blood panel. For example weighing the value of driving glucose down compared to the difficulty (e.g. lifestyle) of doing so. I think for me the takeaway is the this looks like a good way to estimate the biological age of your blood only. This should be combined with other measures (e.g. reaction time, cardiovascular health, VO2max, etc) to create an overall estimate of your biological age. For weighings, in the absence of better estimates they could all simply be averaged together. For example, a typical 10 year old has excellent blood work, excellent cardio, balance, reaction time, etc and would come out as being 10 years old. But compare to a poor kid growing up in a nutrition starved environment, presumably that would reflect in their results (slow reaction time, blood work, etc) and they could come out older. JGC Is the current link to the spreadsheet based directly on the Levine algorithm, or your modified version where you tried to "correct" it to align more closely to the derived methylation profile? As I've posted before, the former is IMO more valuable as it is more directly related to actual health outocmes than the methylation profile; if this is the "modified" version, may I suggest/request that you post both versions and explain the difference? (Thank you again for doing this at all!). The last two boxes on the last line of the spreadsheet are based on my fit to the methylation profile and are labeled with "est." indicating that it is an estimate. Everything else is an implementation of the Levine algorithm. The spreadsheet calculates the Levine values and then uses them in the s=estimate. I don't see the need to post both versions. Just ignore those two boxes if you don't trust them. In Chrome, if you click on the LINK above, a non-functional version of the spreadsheet appears on the screen in a new tab. However, at the upper right on that screen, there is a "Download" pull-down menu that can be used to download a functional version of the spreadsheet. Thinking about the weights in Levine et al paper and the discussion here and in the previous thread on their relative importance, I wonder if you have any take on her reply that they are not standardized to allow for a direct comparison. I take her reply to mean that the weights came out of an inscrutable digital optimization, with no input from the researchers as to what the importance of the input factors should be. As for the "standardized" comment, I don't know what that means or how it would be done. I understand and I am a bit disappointed this is not addressed in the paper, neither it is in the Phenotypic Age paper yet to be published though. For "standardized" I understand it as previously mentioned but of course I might be wrong and never went really through the details, I might ask the authors again. Yes that's the correct quote in this context I believe. In simple terms they found the coefficients from a model fit (the model has many inputs and from a large sample set), so in this sense it's only relevant/accurate by plugging all your values into the resultant equation. To 'standardize' the variables would mean that you would be able to look at them in isolation. I think it gets back to my hack earlier; the most accurate way of learning how to 'optimize' your blood work would be to play with the numbers in the spread sheet and see how they affect the output. But going further and saying one variable is 'more important' than another is going out on a limb. You may recall that a month ago I made 5% variations in all the variables and generated a table that is shown above. This indicated the importance of age, RCDW, MCV, and glucose in influencing the resulting value. What it doesn't show is the correlations between the variables (i.e, are they measuring the same thing), which would show up in a more thorough statistical analysis. Thank you JGC for making this excellent spreadsheet. From your calculations RDW, MCV and glucose are the top three markers affecting PhenoAge. It seems all three can be changed with dietary interventions, namely reducing iron, increasing HDL, and altering food choices to reduce insulin. I looked at my bloodwork from twelve years ago and I my PhenoAge has declined 10 years. I am now 57 with a PhenoAge of 45. My wife is 48 with a PhenoAge of 33. With this new knowledge I will work on reducing iron further and see what the calculator has to say. It might be useful for people to share their data and the slowest agers habits might then be able to be copied by others.